Mona Lisa Smile takes a brave political stand and boldly asserts that women, like men, deserve a college education. I’m not sure America is ready for such a radical notion, but hey, if we can change our minds about slavery, maybe we’ll come around to this way of thinking too. 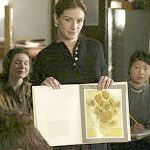 Katherine Watson (Julia Roberts) heads to Wellesley College in 1953 to teach young women about art. To her chagrin, she shows up on day one, unable to teach the girls anything. They have all already read the text for the entire semester. There is something aggressive about the way the students have prepared, as though they are telling Katherine how irrelevant she is. But Katherine rebounds, with the help of her roommates. Nancy (Marcia Gay Harden) teaches poise and fits into the stoic, conservative Wellesley system quite nicely. Amanda (Juliet Stevenson) is a lesbian (shh!) and if she fits in, it is only because she has been defeated by the system. Mona Lisa Smile follows Katherine and her students for a year, and it plays more or less like a female version of Dead Poets Society. Friendships are formed and lessons are learned. In the end, Katherine hopes her girls will stop being such Stepford wives and learn to think for themselves. Roberts stands at the center of a whirlwind and grins the smug grin of an entertainer who knows the audience loves her. A constellation of young starlets surrounds her, each with a cute “type” role. Maggie Gyllenhall is the naughty one, Ginnifer Goodwin is the insecure chubby one, Julia Stiles is the smart one. Only one is girl is saddled with being a jerk, Kirsten Dunst, and she’s given the chance to repent before the movie is over. The characters in Mona Lisa Smile are actually pretty likeable. The trouble is that the movie won’t let them drive the action. Plot requirements force Dunst to be a villain, Goodwin to be a dupe, and Roberts to fall in love. Director Mike Newell pumps the contrast in these developments so that Katherine is actually more progressive (and with better hair) than anyone in 1953. And the villains — Dunst and the school’s administrators — are all more closed-minded, regressive, and bitchy than your average human beings. As an example, one of the administrators is hesitant to give Katherine a break because she finds genius in the work of that no-talent, upstart “painter” named Picasso. It’s interesting that in Mona Lisa Smile, the forces of evil are closed-minded and conservative. A much better movie, The Last Samurai, takes the opposite point of view. That movie mourns the loss of a way of life, and “progress” comes too soon and at too high a cost. When I needed a break from Mona Lisa Smile, I pondered whether someone could make a movie about women’s lib that mourned the loss of the old ways, that could portray their progress as coming at too high a cost. Somehow I don’t think it would work, but at least it was something to think about while the undemanding Mona Lisa Smile played on the screen before me.